DRIESCHER – over a century of success! Right back at the beginning of the last century, Fritz Driescher Sr. (born 1886; died 1951) recognised how important power supply would become in the coming years. When he was just 24, he founded a company in Kapellen am Niederrhein in 1909 and thus established the foundation for the successful history of DRIESCHER that has continued through to the present day. In the early years, the focus was on the electrification of wells, centrifuges, chaffcutters and lathes. He already employed 30 electrical fitters just a year after starting the company. In 1925, the company moved to larger facilities in Rheydt. A large subsidiary work was opened in Moosburg in Upper Bavaria in 1939, which was taken over by Fritz Driescher Jr. in 1948 (now known as DRIESCHER Moosburg). In 1951, the youngest son of Fritz Driescher Sr., Heinz Driescher, took over the company in Rheydt and decided to move and to build a new plant in Wegberg in the late 1950s (now DRIESCHER Wegberg). Specialist expertise, high quality standards and innovative thinking and actions are EXTREMELY important at our company! 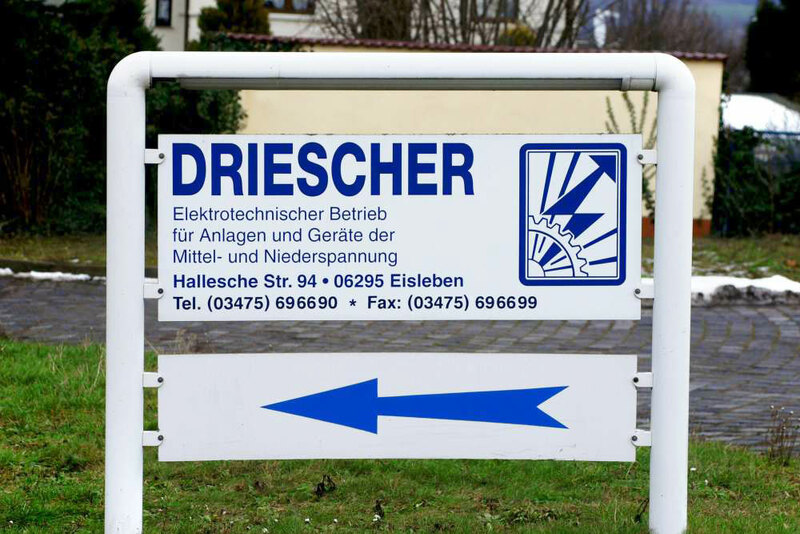 DRIESCHER Eisleben was founded on 01.07.1991 in Lutherstadt Eisleben as a sister company to Elektrotechnische Werke Fritz Driescher & Söhne GmbH. DRIESCHER Moosburg was well known in the newly-formed German states and in prominent expert circles. So what could be better than to make use of this fact and to found a separate, legally independent company in Mansfelder Land. Major factors in this decision will definitely have been the potential afforded by the extremely well-trained expert work force and the favourable geographical location of Eisleben. At the start of 1992, following an extensive training phase at the parent company in Bavaria, the company’s own production began on the site of the former Brosowski pit close to Eisleben. Just 2 years later in 1993, DRIESCHER Eisleben had achieved a significant market share in energy supply services. Supported by the experience of the parent company and with the help of the flexibility and commitment of its employees, the company was able to meet the high demands of the customers. DRIESCHER Eisleben specialises in low-voltage switchgears and switching devices. Through a consistent focus on proximity to the customer and with the knowledge of existing and new energy supply structures, DRIESCHER Eisleben is now not only a producer of MV and LV switchgears and their device components, but also supplies and installs complete transformer stations including all coordination measures as a service to the customer.